We are coming for you Oxygene! In this post I would like to dive into the rabbit hole of sprite records. First, I will provide a short overview of sprite demos, to then share my journey towards SMFX's latest sprite record achievement; drawing 268 sprites, and concluding look at the path ahead to usurp Oxygene as the current record holder. Some of this stuff is technical, and assumes knowledge about the basics of the Atari ST machine, such as the organization of bitplanes. It is an undisputed truth that the Atari ST gets the best out of coders. No dedicated hardware, just the CPU and a frame buffer! Some call it Spartan, others name it Power Without The Price, and a select few say `challenge accepted'! Apart from the Atari scene, sprite record challenges are nowhere to be found. Of course, we are all familiar with some of the sprite demos on other platforms, like on the Lynx for example; but these are just a tongue-in-cheek reference to its Atari origins. And thus, we, the Atari people should be proud that we are the sole origin of this demoscene classic. We all know that competition brings out the best of us! And later that year, results went up as high as 312 sprites per VBL! A quick search over the demo-databases give me the following results: History of Atari demos (combined results of dhs.nu, demozoo and leonard's sprite record page). Delirious Demo 2 Overlanders 136 1990-04 16x14! Over the years, a lot of sprite demos have been made; and it was not until this year that I myself started coding a specialized sprite routine for a certain type of screen I had in mind. I needed a fast sprite rout, and was tired of the same old generic cookie-cutter approach to mindlessly shift the graphic/sprite in 16 places, to subsequently copy the buffer depending on the x-position the sprite was at. So I set off to start coding a sprite generator for my specific need. I wanted to keep track of how different approaches would compare to each other so; so I initially decided to code the different algorithms in a same code-file for benchmarking, so results could be easily compared to each other. I would like to share with you some of my found results and explain the approach/code used to get these results. For general curiosity and comparison sake, I also list my results for 1 bitplane sprites and 32x32 sized sprites; since I was also curious as to how these different factors would relate to each other over different sprite codes. This was my generic goto situation that I have been using in my demos for the past years. Its fairly easy; you can lay out the code, select source data and target position, and just copy it in. One piece of code to fit all the 16 cases, by taking the bounding box of all 16 positions of the sprites, and copy the data. This would yield ~92 sprites per vbl. Of course, reading the buffer can be further optmized with using movem.l (a0)+,d0-d7, speeding up the reading from the buffer part of the algorithm. This will win you a few more sprites (in my measurements, I would hit 95). Its clear that even if we optimized the outer loop code, it will be a stretch to get 100 sprites on screen while we got music playing. A very course estimation would come down to: 1740 cycles per sprite. This was the first step that I could think of. Instead of being mindlessly generic, lets be more specific! And thus instead of just using the sprite source buffer for drawing, use the sprite buffer to generate code. In this case, we can easily omit copying/drawing empty data from the buffer. Thus, when reading from the buffer to generate the drawing code, we omit empty words. (E.g. an empty longword is ommitted for drawing completely in the generated code, and an empty word in a longword results in only drawing the appropriate word). So even worst case, on every 16 pixels, 4 cycles are won. And this improvement is independent on the sprite; whereas the benefit of skipping drawing, or drawing .w instead of .l are depending on the sprite instance. Adapting the clearing routine for this does not yield any improvement, considering it is done by registers. However, by generating the clearing routs for each of the 16 shifted positions, the benefit of omitting clearing pixels if they are not drawn, or clearing words instead of longwords gives some speed enhancements. This makes sense of course, since we now have 16 clearing routines specifically tailored to the shifted sprite; which is generally a smaller area than the previously naively determined bounding box. A very course estimation would come to around 1180 cycles per sprite. One of the cases that begs for optimization is when the sprite is mirrored vertically. As we can see from the generated code in Case 2, all the masks are used at least once, and in the middle of the sprite, the same mask is used 4 times. In practice this means that you can guarentuee that every 16 pixels you have to draw, will have to be drawn twice, but on different offsets. Generalized this means, that every 16-pixel mask that needs to be drawn 2 or more times should no longer be drawn using ori.w/ori.l but instead loaded in a register then then drawn multiple times using the preloaded register. So instead of directly converting the preshifted sprite buffer to code as in case 2, we first analyse the masks in the buffer, and do a count per mask. Subsequently, every mask that is used 2 or more times, is converted to loading as a register, and then drawing to screen. Then subsequently, by iterating through this result, it can be determined what code generation path to follow; case a or case b (with a single ori.l obviously...). Considering this generation code is quite long, and Im not entirely sure how it would benefit this article, I prefer not to list the code here, but instead refer to the published code at https://bitbucket.org/spkr/spkrites/src/default/sprites.s ; line 995. Note; for clarity in the example and also in my benchmark (because it seemed a pain at that time to implement), I have omitted the possible optimization to use movem to load the used registers. Above code and used code generation lacks this optimization. As for the clearing routine, we have already found an optimal solution; at least on a per-sprite basis. A very course estimation would come to around 1128 cycles per sprite. As you can see, we're already hitting the Carebears SoWatt sprite record (134) with this code setup. But we're still not getting NOWHERE close to the records achieved following Leonards challenge (220+). So we have to leave the domain of plotting `every sprite individually' and look for the next step. The obvious next step on top of our previous case is to group the sprites per case (x=0..15), preload the registers per case, and then draw all the sprites that are of this case. Thus, first draw all sprites that are at the source of 16-pixel boundary (x=0), by loading the sprite data into registers once, and then draw many times; before moving to the next set of sprites (x=1). This way we get to load the registers once, and draw them many times, with minimum overhead. The above given example is a simple case, where we have less than 8 values that make up the drawing of the sprite; and there are of course various cases where the number of used masks are beyond the 8 available registers for or.l. 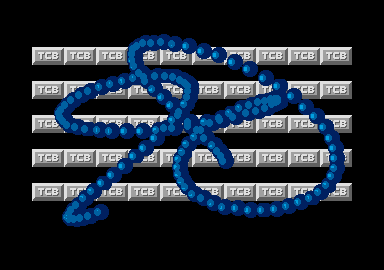 If my memory serves me right; this initial approach yielded my first 200+ sprite count result. This would boil down to around 800 cycles per sprite. Having laid down the format of the `read masks once -> write many' approach, it seemed that there was still a decent gap between the achieved ~200 sprites count using this approach and the 235, let alone the 270/300's. So something has got to give. In order to see what else we can improve on, we have to decompose what is happening. We have already completely optimized the pattern movement (2), by incorporatng this into a 16-part dataset (per frame). Where each dataset corresponds to their related (0..15 position) draw masks and unrolled loops. For the sprite record, Leonard defines (and has shared) the code to generate the pattern, which is a 360-frame loop. So precalcing this, and then adapting it for the used code pattern above yields basically an animation that you can use to get the desired datastream. Since optimizing (2) as a seperate algorithm/concern is out of the question, we are left with finding smarter approaches for (1) and (3). So far we have been clearing individual sprites. In case multiple sprites overlap, we clear certain areas more than once. This is a waste. This can be easily remedied by analyzing the total area of sprites drawn to the screen, and then building a dataset that is an explicit list of offsets of the screen to be cleared by moveing a longword from register to an indirectly addressed dataregister. Considering the sprite demo is bound to be using 512kb at the most (since rules state it must run on a 520ST), having 360 datasets which all explicitly clear their accompanied frame-spritepositions is quite space-inefficient. So some tradeoff needs to be made; balancing the size of the dataset combined with reuse of code over multiple frames. I am using double buffering in the democode, so to quantize the number of clears saved, I would draw frame n-2 on the background; and plot the n-th frame onto this using the sprites with the move instructions. This way I could measure the number of clears initially required to clear frame n-2, and calculate the number of clears saved by determining the overlap of the drawn sprites OVER the n-2 frame. I used a visual representation, by generating each of the 360 frames of the sprites waveform in order to do visual inspection, as well as to provide some practical overview of what my solution would look like. I did both the analysis of the frames, as well as generating the visual representation using PHP on a modern PC. The sprites displayed each frame are the sprites that remain from the n-2'th frame (due to double buffering), and that need to be cleared. The red masks are the masks as displayed above, that represent the `most optimal solution found so far' of sprites to be drawn using move instructions for this frame. Considering I am using a (stupid) brute force approach, and the number of combinations for each solution is huge, I know fairly certain that my dataset used for my sprite record demo, is certainly not the most optimal one. But I guess, that the margin between the most optimal solution, and the one I found, would not make up the gap between Leonards 312 and my 268 sprites. So I wondered what the next big improvement step should be. One day Leonard, one day! And this is the next level step to come to par with the current sprite record giants! On top of doing the hard analysis of the data crunching, one thing not mentioned to a big extend here, is the tradeoff between datastructures used to run the code. And generally the tradeoff is; the number of cycles saved in CPU time, comes from either larger code, or a larger (more redundant) data set. Adding additional differnet cases (partially drawn sprites, and in how many variations), will have direct impact on what kind of data structures you can employ in your code, and still remain under the 512kb memory limit. And smartly encoding data, to keep the data footprint down, will come again at a cost of cycles for decoding the data. In the end, it starts to become more of a compression problem (in a way) for a single task animation player, than a drawing sprites problem. Its this interesting tradeoff between the various approaches that together make the most optimal solution. I have a strong belief that there is a single mathematical solution that can be proven to be the most optimal one, given the constraints imposed on us for this sprites challenge. However, I have (not by a long shot), been able to approach it in this elegant matter. I have come this far by going on my gut feeling, some guestimation, and a lot of blood sweat and tears. So one day Leonard... One day! And in the mean while, Atari coders out there, go have a stab at this topic! Spkrites! sourcecode and all code referenced to in this article can be found at bitbucket. Questions, feedback or anything else; please contact me at spkr [at] smfx.st.